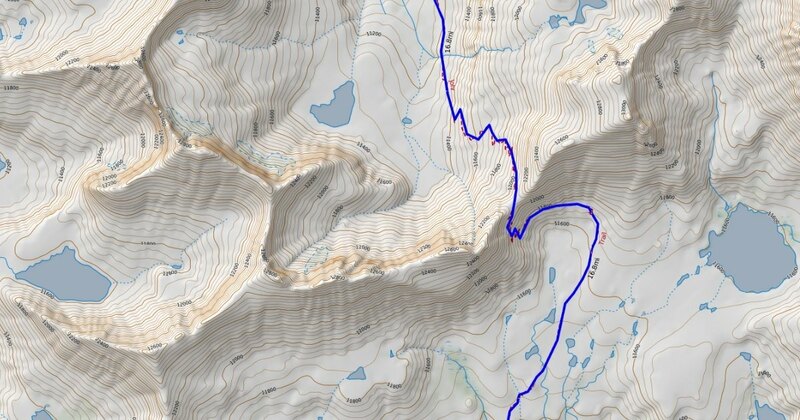 Viewing CalTopo maps works on a smartphone but most of the critical functionality is disabled, so we highly recommend using it with a tablet, laptop, or desktop. We share maps of our trips using CalTopo.com. We also use it extensively to prepare data prior to a trip as it has a full set of tools to create, edit, join, split, and simplify tracks and routes. CalTopo also has many power-user features such as fire history, snow sensor overlays and an excellent map-printing tool. Here are the most critical things you need to know to successfully view our maps and copy our data. The numbered list refers to the numbers in the image. Configure the information you see. By default CalTopo shows the labels of markers and lines. Since our maps frequently have many markers, the labels often obscure the view. Under Config, set Display -> Show Labels to None. The other settings are less critical but you can tune them to your liking. Once changed, your settings are stored as cookies so your view of any CalTopo map will reflect your most recent setting. The map type currently displayed is shown in the upper right corner. To change this, place your cursor on the bubble with name of the currently displayed map type. A details box will appear. Next click on the box in the upper right again showing the map type. Another box will appear with all the available map types. Drop down and select one. 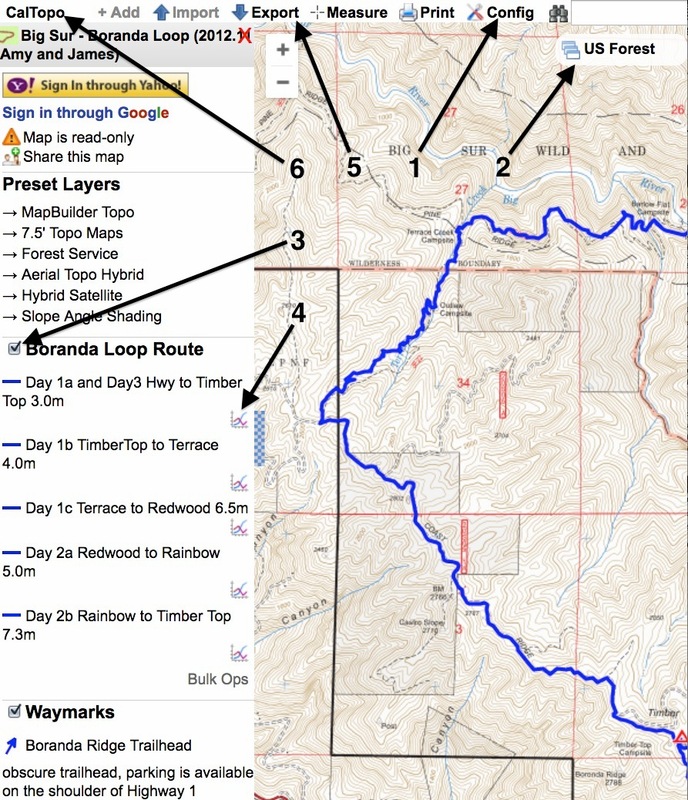 The map types we use most frequently are MapBuilder Topo, Google Terrain, Google Satellite, and TF Outdoors. Folders of data are listed on the left. Toggle the check boxes to show and hide data. View a profile of a line by clicking the graph icon next to the line. The profile will appear at the bottom of the page. You can get more details by clicking the word expand in the upper right of the profile. Alternatively, you can get to the same information by left clicking on a line and then clicking Terrain Statistics. Export data in a variety of formats. If you want to import our data into your own CalTopo map, use Download GeoJSON File. Documentation is available by clicking on CalTopo.